Artist, businesswoman and equestrian, Gail Hought is a native Californian, mother and grandmother. At an early age her love of riding began on the family dairy farm. What does a little girl do who does not have a horse, yet wants to ride? She rides her favorite cow. Recognizing their daughter's enthusiasm and passion for riding, her parents purchased a horse for her. Thereafter, Gail participated in gymkhana, rodeos and horse shows. Since then, her equestrian interests have broadened to include four Levi Ride & Tie's and endurance riding. A lifelong dream of competing in the Western States Trail Ride-Tevis Cup-a one day 100 mile endurance ride, earned her three completion buckles between 1999 and 2001. Gail met Eric Hought in high school and, after graduating they married in 1966. She continued her education to become a registered nurse. In time the family increased to four children. Gail's need to be with them became increasingly important. Though financially difficult, but in the best interest of her family, the sacrifice was made and Gail became a stay-at-home mother. Gail had an interest in leatherwork even before her decision to retire from nursing. With the thought of one day learning to braid, she had purchased Bruce Grant's, Encyclopedia of Rawhide and Leather Braiding. It sat on a shelf, unopened, for over ten years. As the children grew older, free time became available for the pursuit of her own interests, one of which was a continuing strong attraction to leatherwork. Using tools from a previously purchased Tandy Leather Kit, Gail decided it was time to try her hand at braiding. With Bruce Grant's book as a guide, she taught herself to first braid with rawhide, then leather. As she learned each new skill, she discovered she genuinely enjoyed the process, and found she had a talent and a facility for the skills braiding required. Since Gail continued to feel the need to financially contribute to the family, an in-home business, combining her love of horses, aptitude for braiding and gift for art, seemed like a logical next step. Thereafter, Gail's talents flourished and Hought Western Tack, known today as Hought Fine Art & Leather & Endurance Tack, was launched. Gail is primarily known for her artistic leather braiding skills. 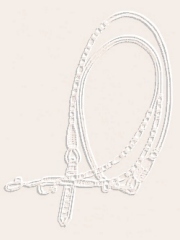 The western world recognized her exceptional talents, when the first of several articles appeared in WESTERN HORSEMAN magazine featuring examples of braided tack including bosal sets, for which she is most noted, romal reins and several headstalls styles. The art community has acknowledged Gail for her watercolor paintings with honors at the juried show at the California State Fair. Her braided work received the People's Choice Award and Best of Show Award for three dimensional art at the Big Bend Trappings, Sul Ross University at Alpine, Texas. She juried the braiding category on two occasions at the "Trappings of the American West" in Flagstaff, Arizona, and was an invited guest speaker in 1998 at Sul Ross University's annual show. Collectors have long recognized Gail as a leading creator of artistically braided tack sets. Those with a knowledgeable eye collect her work and have seen it rapidly appreciate in value. Gail has written three articles for WESTERN HORSEMAN magazine and a project oriented braiding series for LEATHER CRAFTER'S JOURNAL. Photographs of her work have appeared in many horse related magazines. In 2002 WORLD ENDURANCE NEWS featured an article focusing on her watercolor painting. Since 1996, Gail has taught numerous braiding workshops. Encouraged by interest shown in her work, she has written an illustrated series of braiding books for the braiding enthusiast: The Art of Braiding, The Basics, The Art of Braiding, The Bosal I, The Art of Braiding, The Basics-Revised Edition, The Art of Braiding, The Bosal II and The Art of Braiding Romal Reins I.
Braiding leather is but one of the many artistic talents that has served Gail well over the years. She creates pencil drawings, pen and inks and watercolor paintings with a focus on animals. Web site design is another of her interests. Gail's understanding of art and the computer has given her the tools to create interesting and innovative web sites. Avid endurance interest and knowledge in combination with her tack construction skills, Gail builds tack using the beautiful leather-like high performance BioThane&REG; and beta. Always creative, her tack is well-built, attractive, functional, comfortable and safe for the horse as well as easily used by the rider. Eric, a retired teacher, has been married to Gail for over 40 years. He became interested in leatherwork in 1973 as did Gail. In the early years, Gail continued her braiding craft while Eric taught school. He contributed his leather skills, as time would allow, until he retired to devote his full-time energies to creating tack. His strapwork has been the foundation for Gail's braiding. Today Eric, an accomplished horseman, devotes most of his time to raising and training horses for himself and others, and writes many training technique articles. By combining artistic talent with her skill and knowledge as a horsewoman, Gail brings individuality to her craft. Her unique qualities have given her the ability to produced superior products that are not only beautiful in appearance, but functional and easy to use.